On Friday May 29, 2015, our rector, Reverend Father Dionysius Park, OSB, the community of our sisters, benefactors, and construction contractor and engineers, architect designers, members of oblates, parishioners, Kindergarten students, nursing home residences and employees were assembled at the front of the new buildings and the Most Reverend Archbishop Thaddeus Cho Hwan-Kil, Archbishop of Daegu blessed our new buildings: the Nursing Home (Fatima Home), new Haeseong Kindergarten and Benedict Education Center (Spirituality Center and Oblates Office), and the Elderly Sisters Home (Scholastica House). The plan to build the Elderly Sisters Home was passed at the 17th Daegu Priory Chapter in June 1998, however, due to various reasons the plan was postponed. 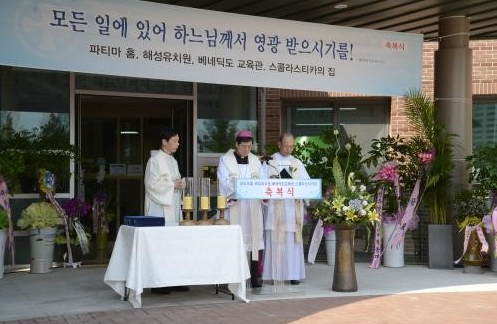 The issue was brought up again at the 20th Daegu Priory Chapter in July 2003 to build the Elderly Sisters Home including the Nursing Home, new Haeseong Kindergarten and Benedict Education Center; and finally the new buildings were completed and could have the blessing ceremony. After the blessing ceremony, the Prioress Sr. Lumen Choi gave address and presented the appreciation plaque to three persons: First to Mukwon Kim, the Director of the Hyundae Architect Design Company who designed the beautiful, practical, and convenient buildings with thoroughness, earnestness and total responsiveness; second to Hongjung Lee, the President of the Hwaseong Corporation who assisted generously to construct the strong and durable buildings; third to Bangsu Chang, the Construction Manager and the related persons who attended in supervision of the buildings as their own houses during one and half years. Since this year, we are celebrating the 130th anniversary of the foundation of a congregation, the 90th anniversary of the foundation in Korea, and the 65th anniversary of the foundation in South Korea; it is more meaningful to have the blessing of new buildings. Before closing the ceremony, the Haeseong Kindergarten students sang congratulatory song with dancing. For the closing ceremony we sang “Te Deum” with Father Dionysius in Latin to thank God for His graces upon our community.